I never stole from people in Fallout 3 & New Vegas. In games, I always end up playing as someone who is comically moral, and so stealing -while tempting- is something I don't do unless I have to in order to avoid killing someone. Then I played Fallout 4 and needed some adhesive. It isn’t like they need it. Taking it wouldn’t be a big deal, it's not like I'd be taking all their money, a fusion core that powers their home, or a huge gun they need to defend themselves; it is just some duck tape. But with it, I could make a silencer for my favorite gun and be able to kill so many super mutants. I bet no one will even realize it’s gone, they are just wasting it. I need it, and this world needed me. These ingrates, they should be begging me to take it. They should be showering me with duck tape! They deserve to have this taken from them for my righteous cause. 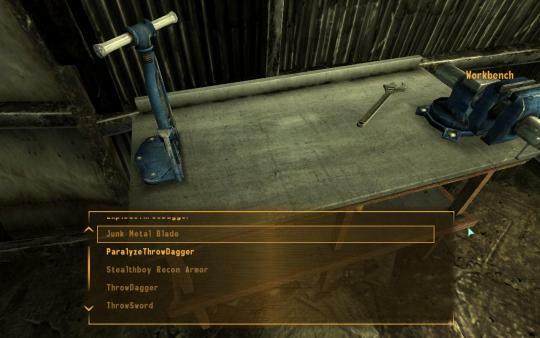 In Fallout 3 & New Vegas loot is basically just heavy, inconvenient money. You pick it up, carry it around for a bit, and then sell it. You don't care what the stuff is, only what the value to weight ratio of the item is. Any flavor applied to it -is it a pocket watch, a telephone, a bloody skull- was incidental. It doesn't matter, it is all just stuff to sell. 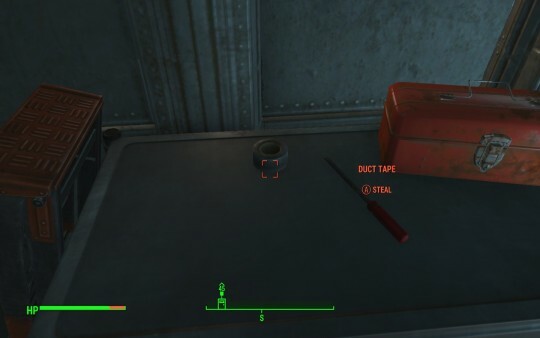 With Fallout 4's robust crafting system though, you do care, a lot. Each item you craft requires specific materials/parts to make, and not all parts are created equal. Some are very common (steal, wood...), some are uncommon (screws, adhesive...) and so when scavenging for loot you aren't just looking for things that have value, you are looking for the parts of the next thing you want to make. Loot isn't generic value stores, it all serves very specific needs. This makes looting a lot more fun because you are always hoping to find that thing you need to make your gun, sledgehammer, or jumpsuit that much better. It is the difference between getting toys and getting gift certificates. You might not always going to get the toy you want, and the gift certificates might be more economically sound, but the gifts have surprises in them beyond face value and that is more fun (if the gift-er is good at giving gifts). Some people are probably screaming at me right now, so I should mention that previous Fallout games did include crafting systems. My point is that they weren’t as robust or core to the game as in this iteration, and as such didn’t change the way the player would perceive or interact with 99% of loot. Crafting and crafting materials are too rare to change the normal experience. In Fallout 3. if you had the schematic then you might try to find or buy the components for that thing, but it wasn't the continuous/pervasive need as it is in Fallout 4. Fallout 4 isn't the first to do this, or the best at it. It is just the most recent. I want to pretend to be topical, so I'm talking about this in the context of Fallout 4. And while this might seem minor, it is important. This adds texture to the game, you aren’t just looking for money, you are looking for specific things. This results in thousands of tiny victories and disappointments that make the game feel better to play. Diablo 3 did the exact opposite of this, by the way, and was the worse for it. Both the Real and Fake Money Auction Houses are now closed, and have been so for a while. While that means I must drop my pretense of topicality, I do think it is worth taking the time to explore why including them was such a bad idea. Say I'm playing a Monk, and I find a really powerful Wizard item. Normally, I'd be disappointed that I got an item I couldn’t use. With the Auction Houses though, I can just sell it to someone who does want it, then I can turn that profit towards buying an item that is perfect for my Monk. The scale of the auction house is so large that it is a near certainty that I can both sell and buy quickly, so long as I don't price my goods to unreasonably. This means that what I find while looting doesn't matter outside the market value of the item. Can I use it? Is it good for my class and build? Does it synergize with my other items? Who cares? It has value that I can use to buy things that are perfect for me. "Soul-Binding," which makes it so that you can't trade certain powerful items you find/equipped, helped alleviate this problem in WoW. 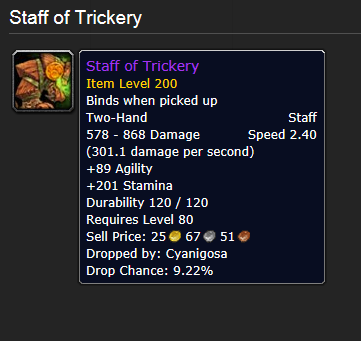 You could buy really good stuff on the auction house, but for the best stuff you still had to get it yourself. Diablo 3 doesn't do this. You can read their reasoning for not doing so here. 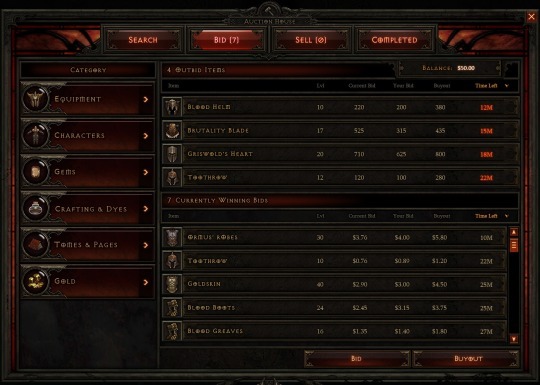 Without anything to limit trading everything you found in Diablo 3 could be seamlessly turned into a version of the thing that you actually wanted. In spite of the fact that all the objects in the game were very specific (randomly generated), you didn't particularly care what you were picking up because almost everything was just going to be turned into money, then into the things you actually want. Thus, loot loses its texture. You can still trade with your friends. It’s true that the things I'm saying about loss of loot texture also apply to trading with your friends, but there are two big differences between these scenarios. The first is scale, trading between friends/guildmates isn't of the scale such that you will always be able to trade for the perfect item instantly. Second, when trading with friends it grows the social aspects of the game. You are in it together, and you are supporting and helping each other. Yay, friendship. So, while you do lose a bit of loot texture, you gain a lot in terms of the social aspects of the game. The Auction Houses, on the other hand, automate that exchange. That makes it functionally anonymous, and thus there is no gain in social interaction or comradery. You lose the loot texture and gain nothing in return. In the end, without all the nooks, crannies, and inperfections from a loot system that forces a player to try cobble together a build from what you were given by a random number generator, equipment functions like just another leveling system. 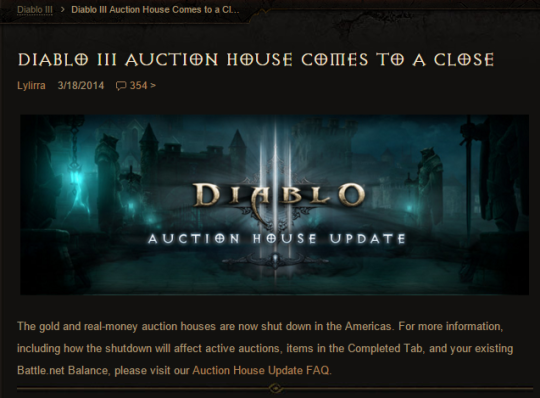 You didn't have to use the Auction House in Diablo 3, this is true. Except you can't really opt out because the entire game is balanced around the assumption that you will. Furthermore, if I want to play online with people then I don't want to drag them all down with me by using sub-par equipment. I might be fine with using crap items and muddling through, but I don't want to force my companions to endure the cost of my self imposed restriction. And isn't multiplayer supposed to be such a big part of this game that we just HAD to always be online to play it? So, yes, you can opt out of the Auction House system, but you can't opt out of all the things that are effected by its presence. The specificity and utility of the loot in Fallout 4 gives us an immediate connection to what we are grabbing and the spaces we are exploring. I know I'm looting an office because of all the phones I'm grabbing, or a lab because of all the glass beakers. Grabbing those makes me happy not because it adds to a total money counter in my inventory, but because I can use those to make specific gun mods that I really want. It gives the world a texture to it that makes it all feel real, and makes the places we are exploring feel like they have a history and a purpose to them, and not just like they are places with money we have to farm.